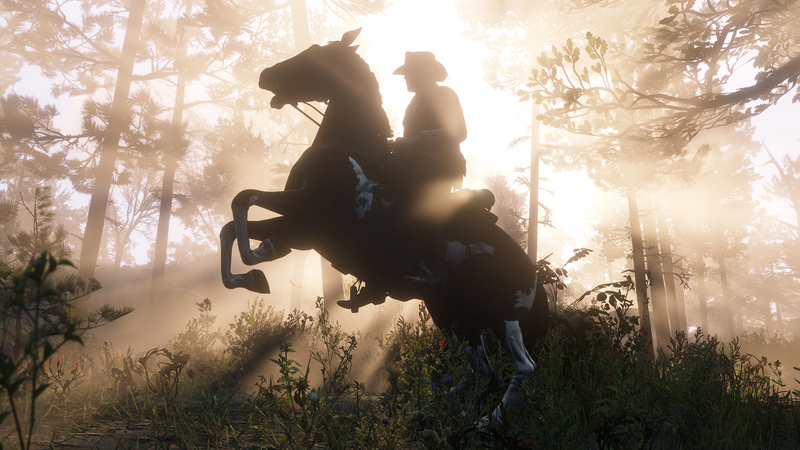 Plus eight other observations from our hands-on time with Rockstar's western epic. The Rockstar headquarters are exactly what you'd expect them to be; hidden in the middle of Manhattan in an unmarked office building, guarded by the prudence of a single security guard. In the past the company rarely offered demos to games journalists—which has secured it a hard-fought reputation of both mysticism and hermeticism—but I suppose that's starting to change ever so slightly. Last weekend the Rockstar PR team invited me up to the studio for a solid hour-plus hands-on time with Red Dead Redemption 2, and I was surprised to find how candid and self-directed the session ended up being. I was given the open-world and the opportunity to prioritize my experience however I liked; be that hunting, looting, or greeting every passing carriage. Here are nine things that stood out. 1. Everybody you'll meet in the game world has been motion-captured. 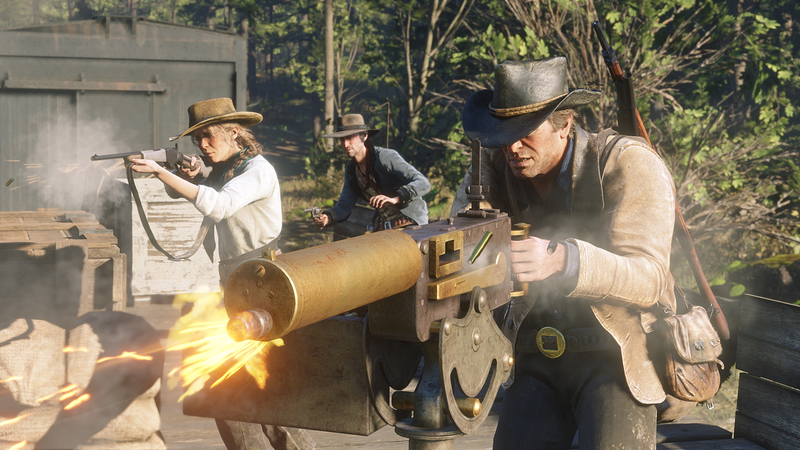 Red Dead Redemption 2 is a gorgeous game for a ton of different reasons, but the one technical tidbit that shocked me is how all the NPCs are motion-captured. Obviously that doesn't mean that every jamoke on the trail has completely unique animations, but my god is that still a ridiculous undertaking, especially compared to the paper-dolls that dot the sidewalks in previous Rockstar titles. One of the favorite guys I met in my session was a down-on-his-luck Huckleberry Finn-type chucking rocks into the river and moaning about some girl who doesn't love him back. It follows the tradition of the many, many roadside diversions you remember from the first game, but the idea that someone in a studio somewhere actually had to role-play his own lovelorness in order to bring it to life makes me happy. Again, I don't know much of an outlier this is—extensive mo-cap work was done for recent open-world adventures like Spider-Man—but it was still the kind of factoid that makes me, a proud plebeian, pretty goddamn impressed. You know when you turn on the summer Olympics in the middle of the day, and fall down a rabbit hole of horse dressage? Remember that surge of rage and envy that fills your body when you realize you will never, ever be rich enough to teach a horse how to dance? 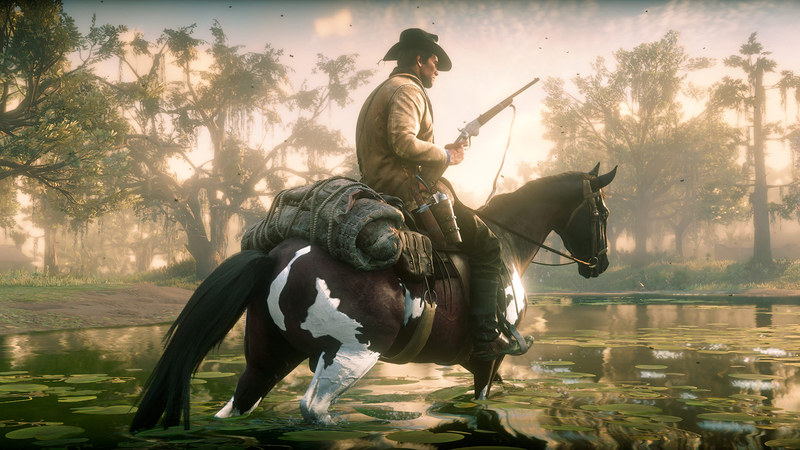 Don't worry, Rockstar has your back, because you can totally make your steed trot, and canter, and pirouette. I greatly look forward to impromptu dressage competitions when the Red Dead servers go online. Spoiler Warning: This portion contains spoilers for the first Red Dead Redemption. 3. Dutch van der Linde sees himself as something of a philosopher-gangster. We know how it ends for Dutch; John Marston standing over his haggard, bedraggled body with a billow of smoke pouring from his revolver. But we've yet to really understand how his story begins. 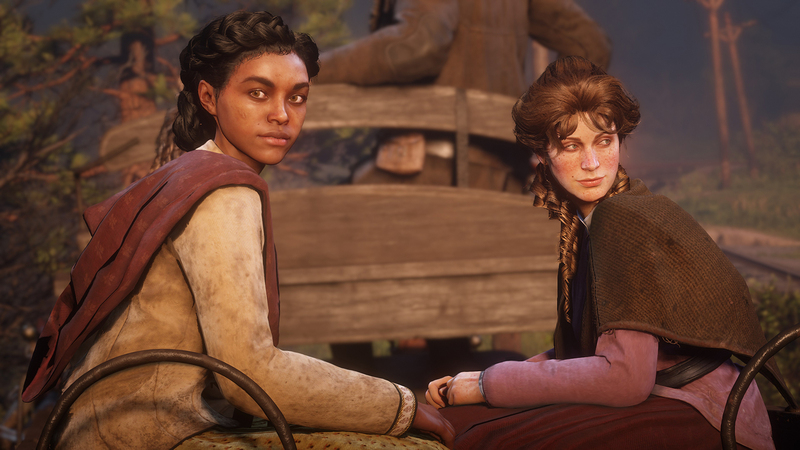 One of the things that the Rockstar representative reiterated to me a number of times throughout the demo is how Red Dead Redemption 2 isn't about the glorious heights of the Van Der Linde gang. Instead, the plot aims to tell us how things started to unravel, before we witness the ultimatum that punctuates the first game. It's still the bad times, but not quite yet the worst times. A large part of this will focus on Dutch's idealism. The man is an outlaw, but he holds a strangely spiritual doctrine. To him, living off the grid is less of a legal necessity, and more of a scurrolous, Thoreau-esque way of life. 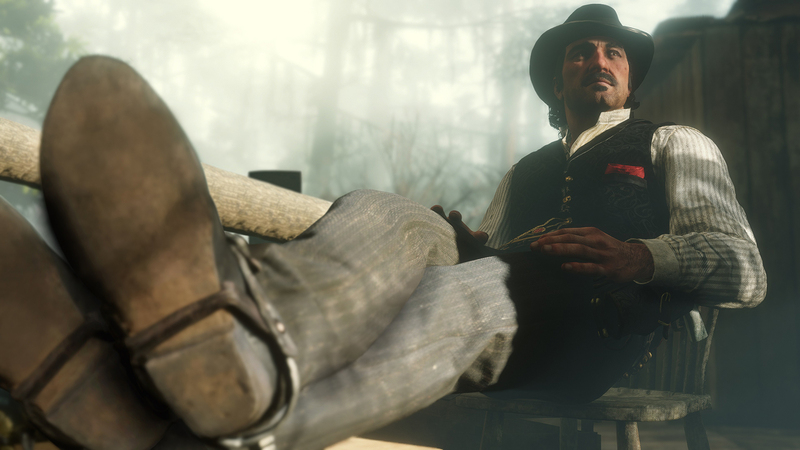 Considering Marston spent the last Redemption desperate to get back to his cozy homestead, I'm going to guess that the cult of personality breaks down sooner than later. 4. There's vendor junk now. When I broke into an illicit backroom business in the bowels of a drugstore, I found plenty of cash, but I also picked up silver pocket watches, unlit cigars, and a box full of bank bonds. The PR rep confirmed to me that Red Dead Redemption 2 will let you fence off the junk you pick up during your many robberies. The Witcher-fication of all video games continues, unabated. 5. A huge number of the items you pick up appear in-game in ways you wouldn't expect. I really thought Red Dead Redemption was going to tip its hand when I walked over to a dead deer to harvest its pelt. The first game forced you into a cutscene whenever you gathered resources. In fact, players would famously park their horses right on top of their kills, in order to sequence-break the animation and save precious seconds. But no, if anything the sequel doubles down on the field dressing. Arthur seamlessly dug a knife into the deer's flesh, and cut through the carcass horizontally before rolling up the hide in a neat, sleeping bag-like bundle. He tucked it under his arm, and I walked him back to the horse, where he tied down the bounty behind the saddle. To be clear: at no point did the pelt disappear into a menu, in the way that items and crafting reagents are traditionally abstracted away from the player for convenience purposes. I know it might sound strange to say that a physical, ever-visible inventory system blew my mind, considering all the other substantial things going on in Red Dead Redemption 2, but it does demonstrate a sense of deliberateness that's unique to the game's design. 6. There appears to be some sort of codex system. In the first half of my demo, I watched a Rockstar rep launch a train robbery that ended with him rummaging around in a private, barricaded car. At one point he grabbed a handwritten note, and the game cut to a first-person perspective where you could read some piquant background flavor on a local character. 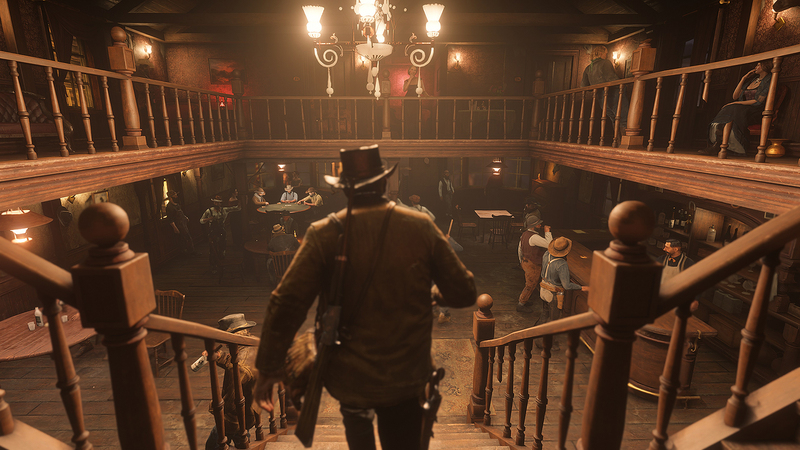 Later, when I had the controller, I walked into a tavern and took a side mission where an author wanted me to track down some of the best gunfighters in the West. Once again, their biographies were communicated through some scrawled notes on a handful of photographs. 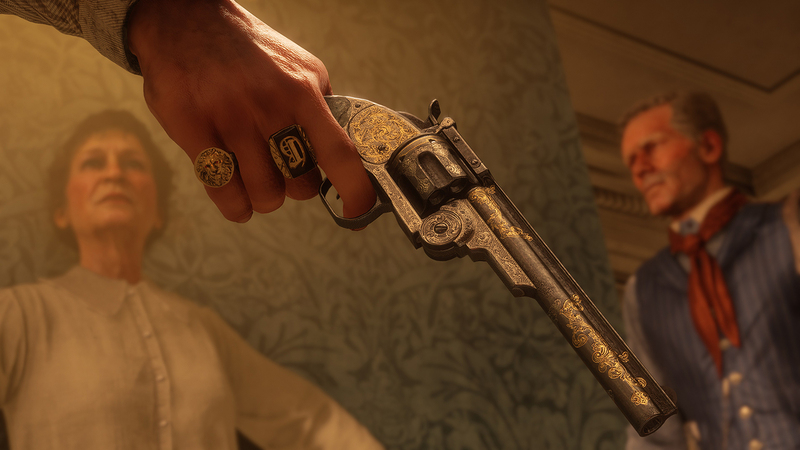 Rockstar generally hasn't included BioWare-style codexes in the past, but it looks like that might be changing with Red Dead Redemption 2. Finally, a reason to use the first person camera beyond looking at pretty gun models! 7. You can pick up and wear any hat you find on the ground. So let's say you're like me, and you antagonize a group of drunk idiots behind a saloon and wind-up in an impromptu shootout. Let's say you kill all of those rabble-rousers, and return to the scene of the crime after evading the sheriff, and you notice a really cool hat on the ground that was lost in the scuffle. You're in luck, because in Red Dead Redemption 2, all you have to do is push the triangle button, and Arthur Morgan will switch out his current hat for that cooler hat on the spot. (If you wear the hat for a long enough time, the Rockstar rep tells me it will eventually become your "default hat.") I very much look forward to the inevitable future where I find myself watching a two-hour YouTube video identifying the location of all the rarest hats on the map. 8. There's a button prompt to spin your revolver. Red Dead Redemption 2 is a game full of silly little flourishes that make you smile, and I think the best of these is how, after pressing L1 twice, Morgan will whip his revolver around his finger, John Wayne-style, before shoving it back in his holster. You can give me a vivid American Southwest and all the pregnant Morricone ennui all you want, I don't care. I'm only going to feel like a real cowboy if I get to do revolver tricks, and I'm glad Rockstar understands that. 9. There's a Big Buck Hunter arcade machine in the Rockstar offices for some reason. I don't know. I just thought that was worth mentioning. 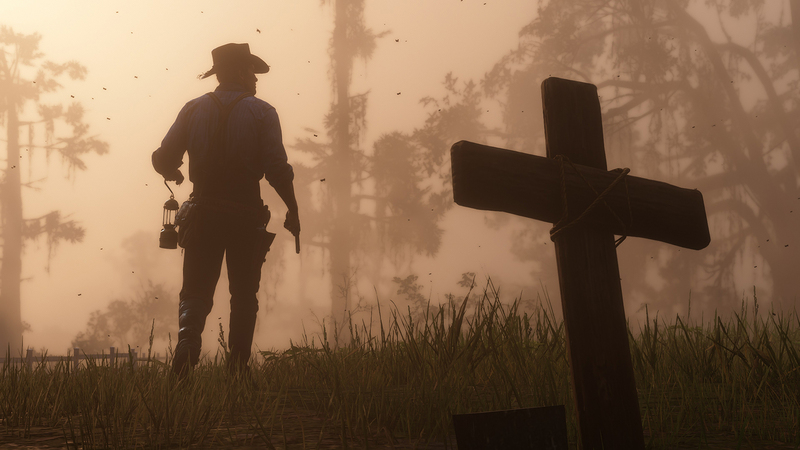 For more information on Rockstar's upcoming open-world western, check out our Red Dead Redemption 2 everything we know guide.